The tabs below provide advising agencies many tools to promote Seattle Central and its programs to prospective students and their parents. Please take a few minutes to review these resources. As always, our office is happy to assist you in your marketing efforts. 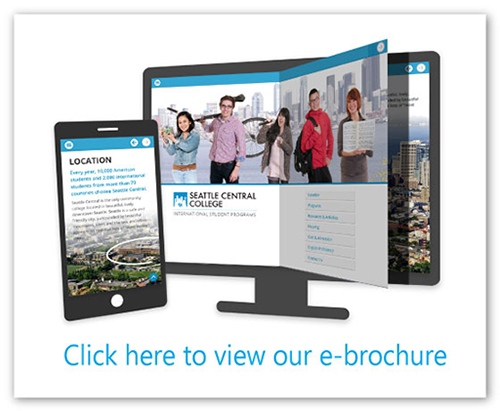 Agents and advisors can access Seattle Central's e-brochure online any time, and share it with colleagues and prospective students and their parents. Our e-brochure provides an interactive overview of our school and its programs, is viewable on any device (desktop, tablet, or smart phone), and can be used whenever necessary for advertising, marketing, or recruitment purposes in lieu of our print materials. Agents and advisors can use the social media platforms below to stay connected with Seattle Central. Agents and advisors interested in or in the process of becoming a partner will receive a set of promotional materials after their Global Marketing Agreement Application is approved. Agents and advisors interested in downloading digital copies of our marketing materials can do so by visiting our Forms & Materials webpage. Choosing the right school is an important and difficult decision students have to make. When considering Seattle Central for their future studies, students might wonder what it is like to study at Seattle Central or how it feels to live in Seattle... Why not talk to some of our current students and get answers directly from fellow peers? If your students have general questions related to life on campus and in Seattle, have them contact one of our current students at SeattleCentral.IntlAskAStudent@seattlecolleges.edu. Note: if questions relate to admission, study programs, immigration, I-20s, or other areas best addressed by a staff member, send your message to SeattleCentral.Intl@seattlecolleges.edu. Questions related to these areas are not addressed by students. Our staff travels overseas frequently to meet existing or new partners and provide important program updates. However, partners who would like to connect with us right away do not have to wait for our next visit! They can use the request form below to schedule a video / web meeting anytime. This is a great way to coordinate a staff training or prospective student seminar when you need it, at no cost, and give your marketing and recruitment efforts a boost. Partners can download a variety of photos for use in marketing materials and promotions. If interested in accessing our photo galleries, contact SeattleCentral.IntlMarketing@seattlecolleges.edu.